Michelle Farmer MA ’10, OTD ’11 is blazing a trail for occupational therapists working in team-based primary care. 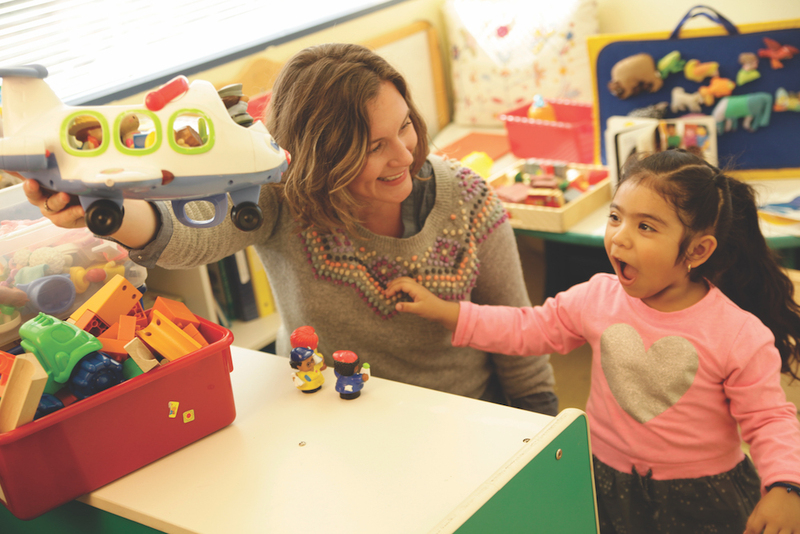 Not only is Michelle Farmer MA ’10, OTD ’11 an assistant professor of clinical occupational therapy and the lead therapist at USC-Eisner Pediatric and Family Medical Center, she’s also one of the nation’s handful of occupational therapists working in a team-based primary care setting. 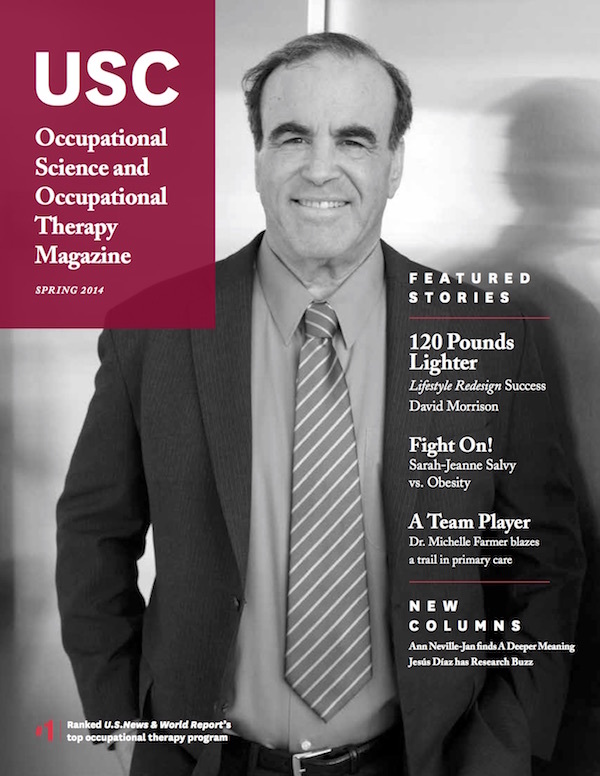 According to a 2013 report from the American Occupational Therapy Association, USC-Eisner is one of only three organizations in the country where occupational therapists contribute to team-based models of primary care. This approach is heralded as a centerpiece of reform efforts designed to yield higher quality care outcomes. Farmer delivers services to children age 5 and younger as well as to adults with disabilities and senior citizens. 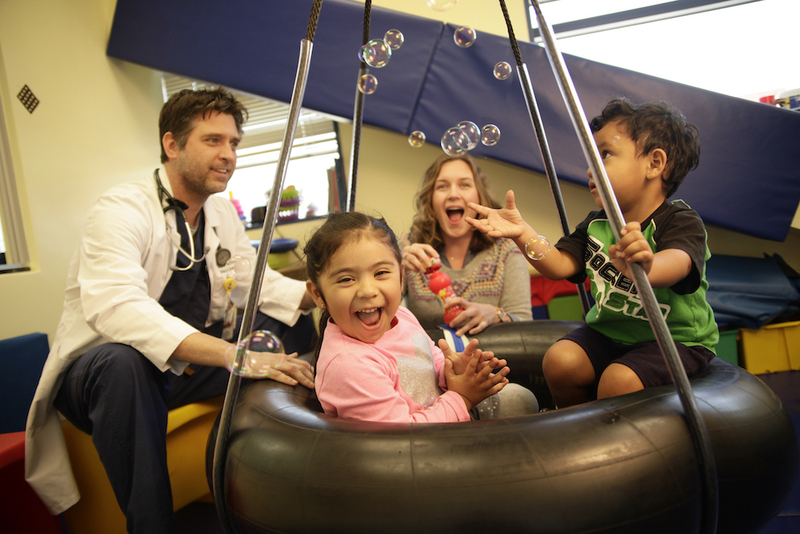 Alongside a team of pediatric physicians and specialists, she treats children at medium risk for developmental delays. At a well child appointment, a parent will complete an Ages and Stages Questionnaire, an assessment that helps determine their child’s risk for developmental delays. Children identified as high risk are referred to established systems like regional centers — nonprofit private corporations that contract with the state’s Department of Developmental Services — while medium-risk children who may not qualify for services can return to Eisner for further evaluation. As Farmer explains, a child’s long-term health and well-being, including educational performance and participation, is put at stake without early, coordinated services. “Allowing these children to enter kindergarten without proper evaluation and intervention may cause them to fall through the cracks,” she says. The academic consequences can follow children for years, as they fall behind their peers and behind educational standards, even to the point of having to repeat grade levels. But it’s not only children who are seen at Eisner. From family planning services to senior care, the facility treats patients across the lifespan — doing so in an innovative way. As a Patient-Centered Medical Home, the medical center partners patients with a primary care physician who then serves as the key liaison with a medical team. It’s a cutting-edge, holistic approach to health care delivery. The team — spanning the disciplines of medicine, pharmacy, social work, occupational therapy and case management — works together on a care plan to set common goals. Farmer also treats adults with disabilities and seniors. She often conducts home safety evaluations and fall risk assessments, focusing on prevention while also taking into consideration the patient’s specific circumstances. In 2011, Eisner Pediatric and Family Medical Center, formerly known as the California Babies Hospital, merged with the Keck School of Medicine of USC’s Family Medicine Residency Program and the California Hospital Medical Center to form the USC-Eisner Pediatric and Family Medicine Clinic at California Hospital Medical Center. This comprehensive partnership allows physician residents to rotate through California Hospital Medical Center, and allows the clinic to be designated a Federally Qualified Healthy Clinic (FQHC), meaning that funding and operation are largely overseen by the Centers for Medicare & Medicaid Services. The benefit to patients, especially those in downtown Los Angeles who might not otherwise receive comprehensive care, is that the FQHC system provides direct access to OTs and OT services. “Being an FQHC [gives] patients access to a range of services not typically provided in a community health clinic setting, such as prenatal and mental health services,” Farmer says. Since its 2011 merger, USC-Eisner has provided family-centered care to more than 8,000 patients across Southern California. Staffers also tap Farmer’s expertise on other cases involving brief assessments and intervention. For example, the Patient Health Questionnaire (PHQ-9) is used to identify depression risk among pregnant women. The screening, which looks at the symptoms of depression and its impact on function, is a useful tool for clinicians and especially relatable to OTs. When treatment teams review a PHQ-9 and identify a client’s occupational challenges, OTs can subsequently be consulted to address them. Farmer is also responsible for educating faculty and residents about the scope of OT — and when an OT referral is appropriate. Whether it’s providing education about occupational therapy to other medical professionals, working with at-risk children or collaborating with other providers in today’s interprofessional healthcare landscape, Farmer’s got a heavy workload. But, she says, she’s able to do it because of her Trojan education.